May Day is a traditional Spring holiday celebrated on May first by many people in our world. The history is long and diverse. We had just moved to a new state and my children’s school had May Day activities. I was so surprised, as this had not been observed in our prior two home locations in other states. What fun we had that year! The children made May baskets, danced around the May Pole and we started a new family tradition of taking flowers to our friends and neighbors. May Baskets are small baskets usually filled with flowers and/or treats and left at someone’s doorstep. The giver rings the bell and runs away. It is an anonymous gift to brighten someone’s day. What a great activity to teach sharing, giving, empathy and caring to children. Here are some basic instructions for a simple May Day Basket that you might have fun making with your children this year. Using the paper of your choice, cut out a semi-circle. Decorate as desired. Ideas: crayons, markers or colored pencils; sponge painting or finger paint (maybe you would like to add a handprint and draw flowers at the end of each finger after the paint dries for a flower “bouquet”, glitter glue, stencils or cookie cutters to add shapes, stickers, ribbon, lace or rick-rack etc. Your imagination is your only boundary. When dry (if needed) fold the paper into a cone shape. Glue together. If you look at the bottom of the half circle (the straight part), you’ll see the “glue here”. Glue the side to the right to the glue here section. 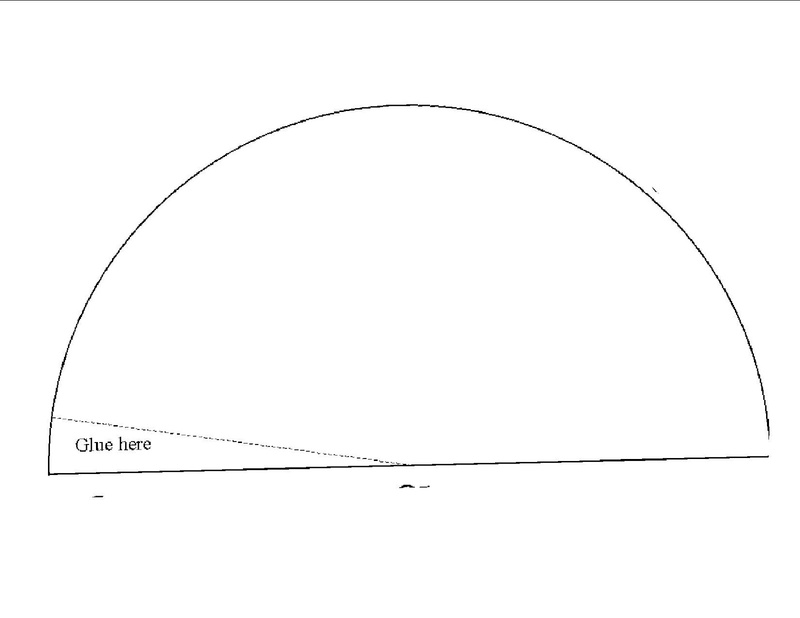 This step is an activity in itself as children see the “magic” of folding a flat piece of paper into a cone! Attach a paper,ribbon or colored chenille wire handle. 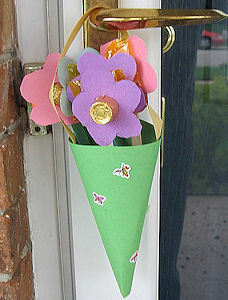 Fill with real flowers or candies and hang on the door of a friend (or the bedroom door of a family member!). smooth edge. Any clean empty food container would work as well, like yogurt or fruit cups. Decorate the outside and fill with flowers. A fun flower idea is to insert a tootsie pop in the center of a construction paper flower. This May Day basket created a butterfly with a sucker and construction paper and a gum ball worm on a paper leaf. Let your imagination and creativity go wild!